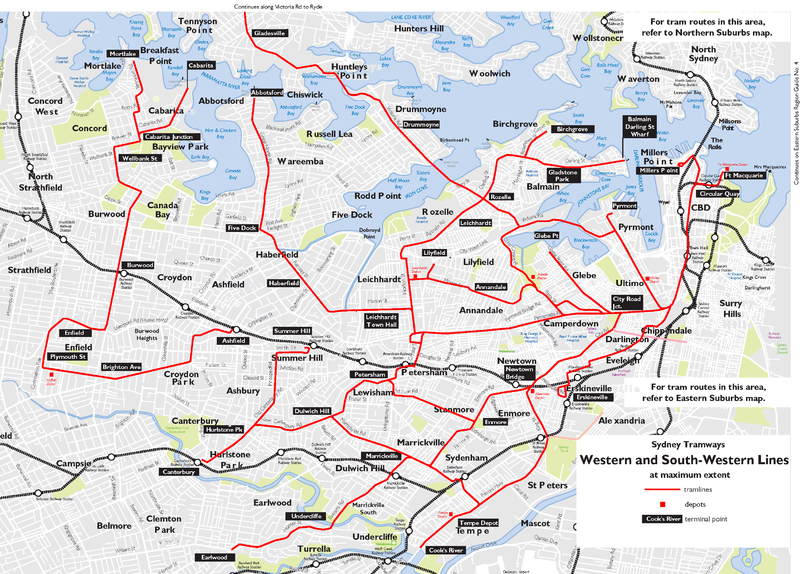 A map showing tram lines in the west and southwest of Sydney. Photo by Quaidy. On September 9, transport authorities announced that the extension of Sydney’s only light rail line would be delayed until 2014. Sydney newspapers asked how a 5.5-kilometer extension of light rail along an existing rail corridor could take four years to complete. Light rail in Sydney has both a checkered path and a bright future. At its peak in 1934, Sydney had the largest network in Australia and one of the largest in the world. It covered 291 kilometers and moved up to 860,000 passengers each day. Traffic congestion and the growth of cars and buses led to light rail line closures from the 1930s. The last light rail route closed in 1961. Sydney still has buses, ferries and heavy rail, but about one-third of trips into the Sydney Central Business District (CBD) are by private vehicle. The City of Sydney estimates that congestion costs the city AU$4.6 billion (US$ 4.7 billion) each year. A 2010 survey conducted by the National Roads and Motorists’ Association (NRMA), a motorist lobby group, showed that 80 percent of respondents thought traffic had worsened in the last 12 months. In response, the state government produced traffic data showing traffic volumes had hardly changed in the last 20 years. Few major public transport initiatives had been announced in that period, either. In 1997, a new light rail line was built along an existing disused rail line through inner western Sydney. It is the extension of this line by an additional 5.5 kilometers that has been delayed until 2014. Despite the small light rail presence in Sydney, there is a lot of support for expanding the network. New lines, and the revival of old lines, have been suggested by many groups. In 2008, prominent Sydney academic Garry Glazebrook identified Sydney’s key strategic light rail corridors. The City of Sydney wants light rail down Sydney’s main CBD road – George Street. This line would connect the new Barangaroo development to Central Station. A government report suggests the existing heavy rail line near Barangaroo won’t be able to cope with the extra workers and residents. Two local councils are behind a proposed new Eastern Sydney light rail line that would serve major sporting stadia and universities. Ironically, this line would follow an old light rail route that was ripped up in 1961. Transport advocacy groups have also suggested new light rail lines for Sydney. The East-West Translink would connect Sydney’s inner west with the international airport and the eastern beaches. The new lines would have nothing on the old network but the wealth of ideas suggests light rail has a future in Sydney. It seems the recently elected state government is prepared to listen to these ideas. It has all but committed to the light rail line through the CBD to Barangaroo, and it has also commissioned a route feasibility study for the line to the eastern suburbs.